Building a quality social media campaign requires having a strong business strategy, and a good business and social media strategy requires using quality social media campaign tools effectively. While the process of starting a social media campaign might seem daunting, there are actually just a few key tips and principles you need to know. The following five tips highlight key ways to use your social campaign tool in a way that grows your brand and business in a way that is simple and practical, yet effective. One of the key purposes of a social media campaign tool is that it highlights contextually relevant data throughout the primary social media platforms and networks. This gives you unprecedented analytics thatdig into the campaigns of your brand and thousands of other competitors. This type of analysis allows you to see the trends that successful brands used to establish a successful social media marketing software and campaign strategy. Discovering the strategies of other brands and the successes or failures of their strategy enable you to plan for success in practical and profound ways. Social media intelligence tools ultimately help you analyze trends and data with the ultimate goal being that you can more easily determine where to spend your budget and how to focus your time. Instead of shooting in the dark and making unfocused guesses, you can quickly create quality content. This, in turn, will help free up your time so that you can spend crucial hours every day engaging with your audience. Using advanced analytics, you will realize what is and is not working in the social media landscape. Then, you can use this data to brainstorm novel and exciting content ideas for your campaign. This is the true brilliance of a social engagement tool. Once your brand discerns what is working and what your target audience is responding to, you can enact a plan that capitalizes on the data your campaign tools gathered. 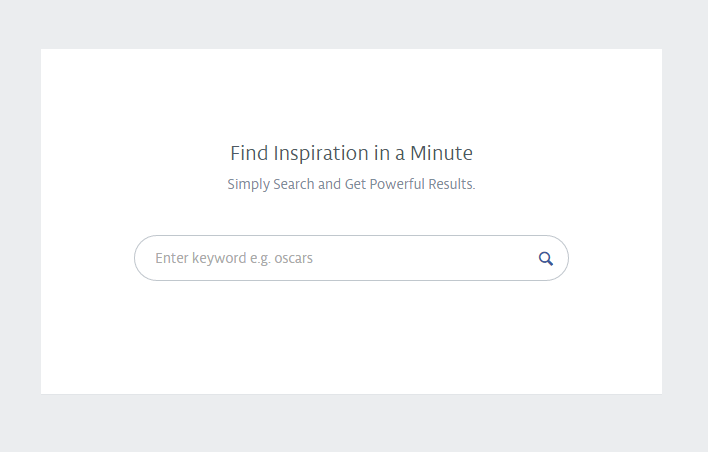 Unmetric’s latest feature called Inspire acts as a search engine of social media content. Marketers can search for any topic Christmas, Selfies or 4th of July and thousands of pieces of related brand content shows up in a matter of seconds. Just be sure not to sit on your fresh ideas since the social media landscape is constantly evolving. As such, once you have identified fresh content ideas, put the plan in motion to produce your relevant and innovative content. Social media moves too fast to get caught in the dust of other brands putting their ideas into action, which is why a campaign tool is essential. With a campaign tool, you can quickly analyze relevant data, create fresh ideas and publish those ideas onto social media platforms. Taking decisive action like these social media campaigns drives brand growth while increasing user engagement and excitement about your brand. Too many businesses with great intentions do not maximize the potential of a social media campaign because of tunnel vision. In other words, they get so focused on building their own brand, they don’t take stock of what their competitors are doing. This is a classic example of “missing the forest for the trees”. Your brand can easily avoid this pitfall by using a social media engagement tool with analytics that show you where other brands are succeeding and failing. In this respect, your competition can serve as the laboratory guinea pig that highlights the difference between successful and unsuccessful social media campaigns. Even better, quality monitoring tools easily track this data for you, saving you time and energy that is best spent on growing your brand. Unmetric offers campaign intelligence which employs data analysts and computer algorithms to log and curate cross platform campaigns being run by brands on social media. Using this feature allows you to benchmark individual campaign performance against not only campaign ran by yourself but also other brands. Another crucial aspect of monitoring the competition is that you can see if they are adopting some of your successful campaign strategies. If a brand has tapped into your successful strategies, it is likely that your campaign will be less effective than it was when your idea was fresh and unique. Being tipped off to imitators helps you continue to refine your strategy and content creation in a way that keeps you one step ahead of the competition. One of the most important aspects of a social media engagement tool is that you can listen to what users are saying on social media. This essential process of a good campaign strategy allows you to hone and refine the content that you create and publish on social media. Most importantly, listening to user feedback is a critical component of engaging with your audience. 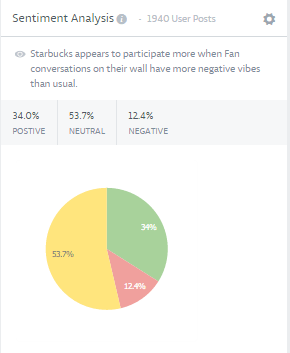 Unmetric offers sentiment analysis, on posts made by fans. Posts are broken into one of the 3 following categories: Neutral, Positive or Negative. The sentiment can be changed on individual posts, in case the algorithm does not pick up sarcasm or slang helping users derive more accurate data. Finally, when you are building a brand, ultimately you are building and growing a business. As such, do not forget to measure the return on investment you are getting out of your social media campaign. One of the best ways to analyze your return on investment is to start the analytics process at the outset of your campaign. Too many brands fall into the trap of looking at data once the campaign is over. Using a social media campaign tool to collect and analyze pertinent data will ensure that you are constantly getting the data you need. As such, you will easily discern where your budgeting and marketing efforts are successful, and where your efforts are less successful by comparison. Track your budget expenses and who’s following you on social media as the campaign progresses, and it will become much more apparent where the campaign is most successful. Once your campaign has come to an end, it is still extremely helpful to pour over the campaign’s performance as a whole. In the process, you will notice where and how you completed the goals you laid out from the start, while also noting areas for improvement in the next campaign. Use Unmetric to track and benchmark your next campaign so you can see how it stacks up against the competition and how it affects your social media KPIs. Sign up for a free trial using the button below.